Immigration Authority: Not a single infiltrator crossed border into Israel in 2017, while 4,000 illegals left voluntarily. The Population and Immigration Authority today published a summary of the 2017 data regarding entry and exit of infiltrators and asylum seekers in the State of Israel. According to the data, no infiltrators entered Israel in 2017, while 4,012 illegal residents voluntarily left, of whom 3,332 were nationals of African countries. 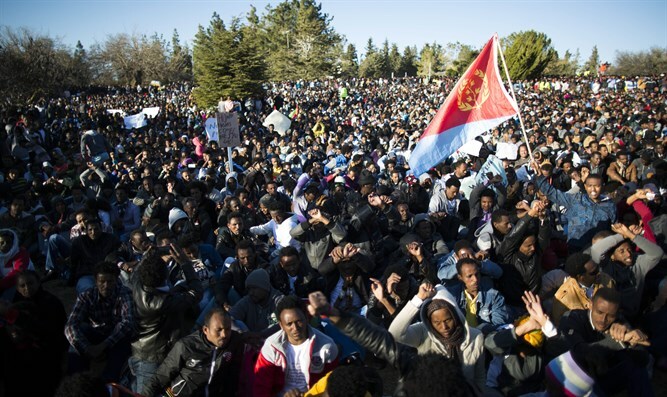 During the past year, 1,682 asylum requests from Eritrean nationals were submitted, as well as 868 asylum applications from Sudanese nationals, 7,710 requests for asylum by citizens from the Ukraine, and 1,350 applications for asylum from Georgian nationals. The hermetic border of the past year continues the trend that has been recorded on this issue in recent years. In 2016, only 18 infiltrators entered Israel. A year earlier, their number stood at 220. The peak was recorded in 2011, when more than 17,000 infiltrators entered Israel. Interior Minister Aryeh Deri said after publication of the data, "We are now embarking on the big operation of expatriating infiltrators into a third country, and there are only two options for infiltrators: voluntary deportation or indefinite detention. The Hulot detention facility will close. 'The poor of your city come first'." Yossi Edelstein, the head of the Enforcement and Foreign Affairs Administration in the Population and Immigration Authority, claimed that many of asylum requests were false. "Unfortunately, the subjects abuse the asylum mechanism in the State of Israel and submit asylum requests that are fraudulent."